As an additional cost to play this event, spend clickclickclick. "Hello thank you for vidding MegaBuy I'm Carol how can I help you." Here are some of my possibly controversial ideas about a reasonably talked about card : it's overrated. In short, I'm not convinced the payout is worth the clunkiness and lack of flexibility for most decks. Take my opinions with a pinch of salt; it hasn't been out for long, but snooping here and on a couple of forums it seems like there a couple of players (who are better than me) coming to a similar conclusion. Playing a Day Job is +4 credits (ignoring clicks to draw in all analysis). This 1 better than Sure Gamble, and equal to Lucky Find. However, how often do you play Lucky Find (which is what I'm basing my analysis on) and then click twice for credits? I assume it's not that often. -You can run the same turn! -Can be played the turn it's drawn. -You can combine it with other econ. -Better maximum payout with prepaid. -Can be economical with Same Old Thing. 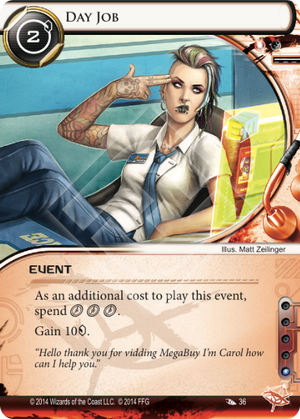 Now there's been a lot of talk about using the with Prepaid VoicePAD, however I'm not convinced a prepaid deck would be worth it in Anarch without Kate "Mac" McCaffrey: Digital Tinker, Diesel, Quality Time and Levy AR Lab Access in faction. Subbing it into Kate, it's a strictly worse Lucky Find that saves you 1-3 influence. It might be worth swapping one in a couple of months to make room for Clot; however outside of that I think the impact on your ability to pressure remotes is too dramatic and is an underestimated impediment on how a deck like Prepaid Kate wants to play. It is possible that that these factors could be mitigated by some of the click acceleration in the new box, however I don't think it's worth playing those cards simply to make Day Job more like Lucky Find. Places I think it could be used include as 1-2 of in Anarch decks wanting to play a slightly longer game / pressure glaciers, and decks which manufacture their own threats. By this I mean those using cards like Vamp where you have to worry less about your ability to respond to the corps actions. I would like to note that I don't think Keyhole on its own is sufficient for this as it doesn't allow you to dictate to the corp enough to stop them winning before you do; you run the risk of getting taxed out while the corp is still able to score (especially because of the way Day Job turns create windows). This card will be in a lot of Anarch decks. It simply has none of the drawbacks of needing to be built around or having half the effects negated like Duggar's, and works out to be a Magnum Opus turn of credits. Being 1 Inflence, it might see play in Prepaid VoicePAD decks as a compliment or replacement to Lucky Find. Especially Anarch versions that are sure to come.